An complete Aero Glass Form that support Aero Color,Aero Events,Aero Glow,Aero Enabled,Aero Glass Enabled and more.It can show black texts and with ShowLabel method you can convert your old Label to New Labels that they support Aero! Important:For help to us,Please vote to this. It add Aero Glass to your Forms! 1- AeroGlassEnabled: Gets or sets Is Aero Glass Enabled? 2- AeroEnabled: Gets or sets Is Window Aero Enabled? 3- CurrentAeroColor: Gets Windows Aero Color. 4- GlowValue: Gets or sets Value of Labels Glow. 5- AutoShowLabels: Gets or sets Is automatical call ShowLabel for all Labels in the Form? 1- AeroEffectEnabled: Occurs when Aero Turn on. 2- AeroEffectDisabled: Occurs when Aero Turn off. 3- AeroColorChanged: Occurs when Aero Color changed. 1- ResetAeroGlass: Change all of Form to Aero Glass. 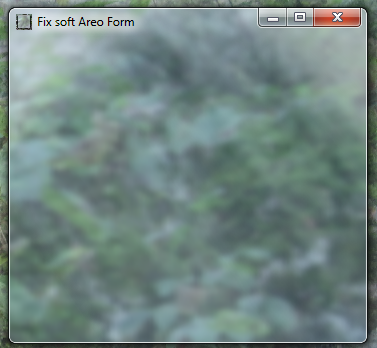 2- ExceptFromAero: Change all of Form to Aero Glass excluding a Control. It run normaly in Windows 7,Windows Vista and above and can run in Windows XP. 2- Select Windows Forms category. 3- Select Fix soft Aero Form. If you like this product, Go and see Fix soft HyperAero Form!